The Nintendo 3DS has a strong library which is greatly enhanced by the excellent selection of unique downloadable games on it's eShop service. 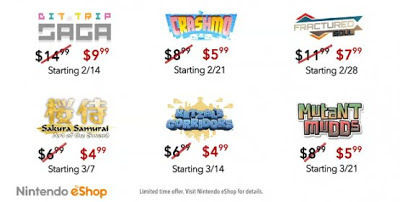 Starting today, Nintendo is running a sale on select eShop titles with a different game each week leading up to Spring. All titles in the sale are being discounted between $2 to $5 which is a pretty good deal considering the quality of the featured games. The sale is likely being used to get more people onto the 3DS eShop for the great selection of new games hitting the service this spring. Grab F-Zero For 30 Cents On Wii U Now! Ghost In The Shell Prequel Shines In New Trailer! OUYA Coming To Stores June 2013!